We're still in full on toddler/preschool mode here at the Wilder house for the time being. It's a super fun and adventurous time to have a crazy little minion at this age. Jake is curious and busy and constantly learning. His little imagination blows my mind. And his tornado tendancies make me crazy, haha. So today I thought I'd share some of our favorite things that make life easier with a 2 (almost 3!) year old. Booster Seat - My little shortie isn't even close to being tall enough to sit at our high top breakfast table, so we've been utilizing a booster seat for awhile. I love our Deluxe Booster Seat from Toys R Us. It's inexpensive, travels really easily, and has detachable pieces that allow it to grow with your kiddo! We leave the tray off the seat and strap this bad boy onto a regular chair so Jake can sit at the table just like J.B. and I.
LeapPad - We've had this fun toy for about a year now, and Jake absolutely loves it. What is it about kids and technology? He's 2! As opposed to an iPod Touch, the LeapPad 2 is virtually indestructible. There's nothing he can access that would be a hassle to reset and I can purchase whatever games I like for him. While a lot of the games sold in stores are actually cartridges that fit into the device, I prefer to buy his games online and have the whole thing downloaded directly to the device. No extra cartridges to keep up with! I have found all kind of cool learning games for him that he would play for hours if I let him. Maybe that's the con to this one - limiting screen time! Place mat - Oh, you don't want your table to be covered in peanut butter, milk, crumbs and other ooey, gooey slime? A place mat friends! I absolutely adore this perfect little place mat I ordered from Sarah + Abraham. Jake loves to find his little cartoon self, and the back has a display of the entire alphabet so he can practice his letters. Bathtub Road and Cars - Any kind of bath toy is always a big hit at our house, but we hit it out of the park with this set of roads and vehicles. The soft foam pieces can float or stick to the side of the tub. Jake has a great time creating paths or just zooming around like the various pieces. And it all comes in a mesh hanging bath that dries itself! These are sold just about everywhere! Mega Bloks - Everyone loves legos!! Mega Bloks' First Builders are great for younger kids because they are larger and easier to put together. We've got a table, a couple of race tracks and a slew of blocks. Jake loves to build and create! Dwink Holder - Some tikes are great at holding juice boxes. Others, that seem to share my DNA and live in my house, are not so great. One foul move and everything I own is covered in milk or juice. Which is why we love our Dwink holder. The pouch fits inside the hard plastic of the Dwink holder and the kids have two large handles to carry around their drink. Why didn't I invent this?? Puzzle Rack - Jake is huge fan of puzzles. And if you don't keep them organized, a bunch of puzzles can equal a giant mess. Insert the puzzle rack. It keeps all of your fabulous puzzles organized and still accessible for your little one to grab. 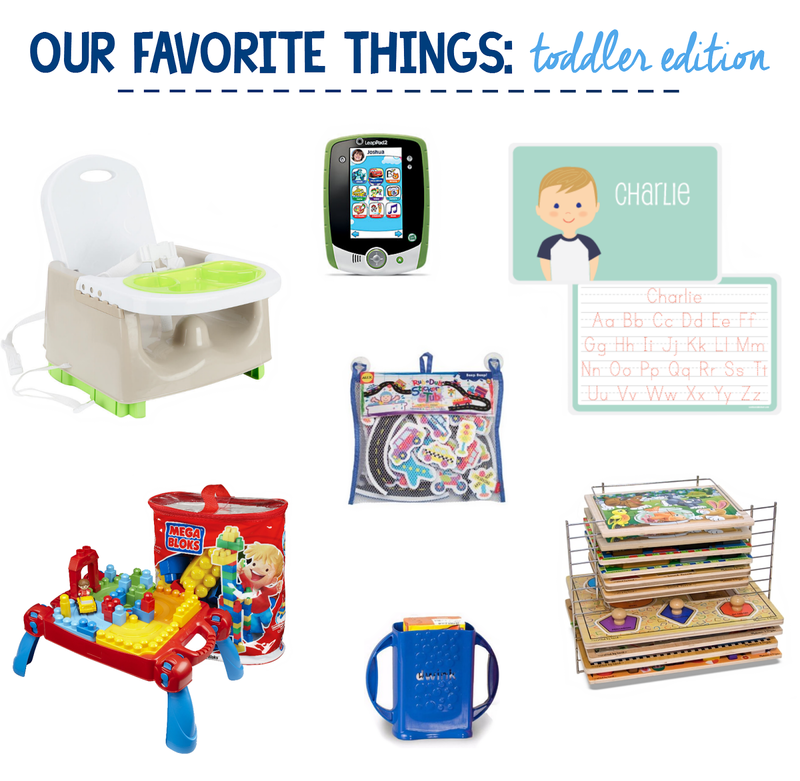 Are any of these must-haves for you as well?